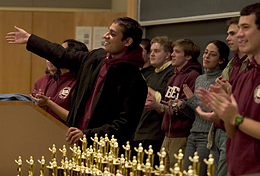 Bates College sophomore Vaibhav Bajpai of Calcutta, India, organized the tournament with the help of his debate teammates and their coach, Bryan Brito, director of debate at Bates. Lewiston High School speech coach John Blanchette, Bates Class of 1987, helped to organize the speech events for the tournament. Schools receiving top tournament honors from the Brooks Quimby Debate Council were: Yarmouth High School for best overall performance by a team in Student Congress; Cape Elizabeth High School for best overall performance by a team in speech; and Brunswick High School for best overall performance by a team in Lincoln-Douglas debate.